Make sure to also read this article on why you should not leave your job to follow your dreams. It may surprise why. Making the decision of whether or not to quit your job to follow your passion – or at least escape the pain – is never an easy one. There are many pros and cons to balance out: from the financial aspect to safety to freedom to fear, it’s not simple to pick the right move. 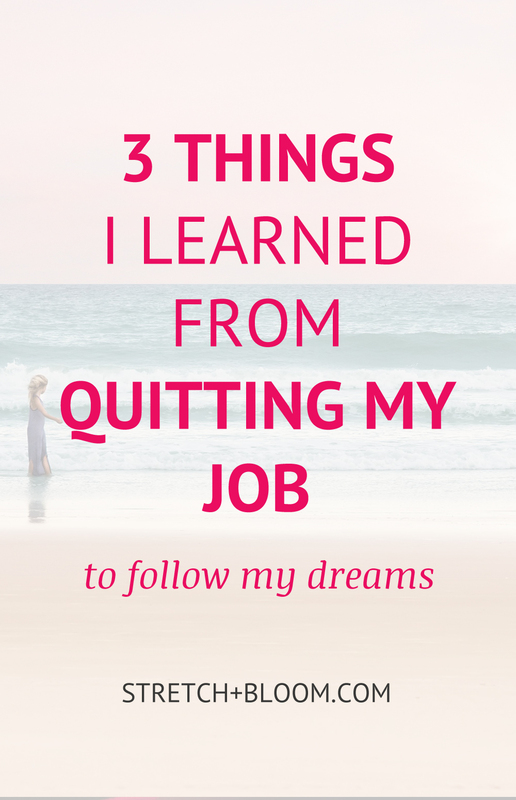 Here are 3 things I learned from quitting my job to follow my dreams. If you’re anything like me, you’re invested in what you do and your work becomes personal. I remember having a few big projects on my plate at the time I made the decision to quit and it didn’t really feel like the right time for me to leave the company. It was hard to let go and to come to the conclusion that I had to leave for my own sake. I felt guilty, I felt I was been a huge let down to them and to my babies. Yes, after working intensively on these projects for a few months, losing sleep and skipping meals to see them through completion, they had become my babies. Well, you know what happened to my babies: a couple of them got axed! Companies shift priorities and projects get shelved. It’s part of the game. Nothing personal. It kind of puts things in perspective though. No project is worth compromising your health, your well-being or your mental sanity over. Your boss will take care of himself. Now, that’s not a reason to be callous and slam the door with no consideration. Follow the appropriate guidelines in your industry and make yourself available to facilitate the transition. However, don’t delay your decision under false pretexts. No matter how irreplaceable you believe you are, trust me, they’ll get over losing you. No project is worth compromising your health, your well-being or your mental sanity over. Take care of yourself. Your boss will take care of himself. When I finally decided to leave, I really wasn’t sure how I was going to swing it. I had a hankering to spend time abroad, to be more creative and to do something aligned with my personal values. However I had no concrete plan and my savings were not enough to take me far. All I knew is that I couldn’t stay where I was because this job was killing me. Also, it was clear to me that getting a similar job wasn’t an option either. The problem was deeper than that. I just wasn’t aligned with the whole lifestyle and that was making me miserable. Anyway, after weeks of stressing it came to the point where I had to make a decision. I reasoned if my soul was dying in this job, my soul probably had a better plan for me to follow. I decided to jump ship and trust! Now I am not advocating for you to follow suit blindly. It was a very risky move. But in my case it paid off! I opened up to my boss about the situation and he was extremely understanding. We came to a great arrangement that allowed me to leave with peace of mind and buy myself enough time to figure things out and put a plan in motion. Conclusion, when you put yourself behind your dreams doors open miraculously! After the stress that comes from deciding whether or not to quit, negotiating and transitioning out, finally comes the day when you leave. There are people who you’re sad to leave behind. Others, you just can’t hide how excited you are never to have to see their sorry a** again. Yes, freedom tastes pretty freaking good! And then comes the question: what do you do next? It’s pretty awesome to spend every day living life on your terms following something you believe in, even if you don’t really know what it is yet. Waking up with no stress, taking time for yourself, having time to be social again feels really wonderful. But it’s also very easy to drift, waste time, be unfocused and go into panic when you look at the finances going out but not coming in. That’s when you must remember: this is not heaven yet. It may be more like purgatory. So don’t fall asleep, there’s work to do! After neglecting yourself for some it’s necessary to take time for self-care. You will need to be on top of your game for the challenges that lie ahead. Get re-acquainted with yourself and your dreams. Do some soul-searching to find a path not dictated by fear and safety but by passion and purpose. Dreams won’t build themselves, you need to build them. Decide on the first step that you can take and get to work. Of course, freedom comes with a price tag. You will need more personal discipline, you will have less safety, and it can also be stressful. But whatever stress or challenges that may come with creating your life are a million time better than the cost of wasting your life on the wrong track.